Four of Wands Tarot Card. The True Interpretation. The Four of Wands Tarot card is one of the number cards in the suit of Wands in the Tarot. This card is one of the Minor Arcana cards. The Wands are also known as Rods or Staves in different Tarot decks. The suit of Wands is connected with action, creativity and movement. It belongs to the element of Fire, the colour red, the season of summer, the direction of south and the timing of midday. The astrological corresponding sun signs are Aries, Leo, and Sagittarius. The key words connected with the suit of Wands include adventure, bravery, charisma, confidence, courage, creativity, energy, enthusiasm, motivation, optimism, passion, risk-taking and zeal. 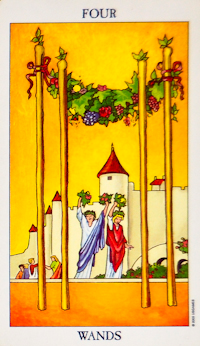 The 4 of Wands meaning is traditionally associated with celebrations, holidays or parties. It is all about happy times and sharing these with friends and family. The Four of Wands can be a very positive and uplifting card in Tarot Readings and shows good times ahead and reasons to celebrate. The 4 of Wands can also signify freedom and the feelings of release that come with it. When the Four of Wands appears in Tarot Readings concerned with love and romance it usually indicates a reason to celebrate. An engagement, marriage, anniversary or commitment promise. The Tarot meaning for questions concerning career or business in Readings often represents a great success. Perhaps you’ll be celebrating getting a longed for job or getting a well deserved promotion. For business ventures it can indicate landing a big contact, signing a lucrative deal or reaching milestones. 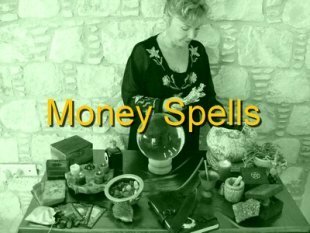 The Four of Wands Tarot card meaning for questions related to money and finance usually relates to perhaps a windfall or unexpected money coming to you. It will be enough to splash out and enjoy a celebration with those you feel closest to. When the 4 of Wands appears in Readings concerning health and well being it can show an improvement in your sense of well being. If you’ve been awaiting test results it can show a reason to celebrate. It is also a great card to indicate a pregnancy and birth of a baby. If the Four of Wands is prominent in a Tarot Spread it can show that you will have a sense of freedom excitement and anticipation. It can indicate a surprise or unplanned joy or planned events such as weddings, anniversaries, birthdays and celebrations. It is a joyous card. 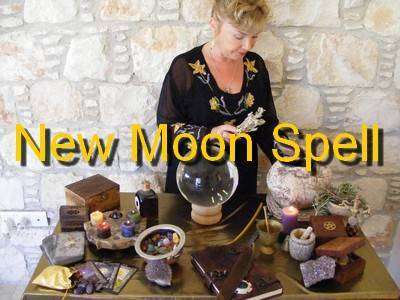 I use Tarot cards from the Suit of Wands in my Confidence Spell and Prosperity Spells for ridding negative energies and promoting attracting, positive energies.